Posey is my sidekick, if a girl can have a sheep for a sidekick. When I open the gate, she is the first to greet me. When I walk by the fence, she trots over to baaa a hello. When the ram gets annoyed with my presence, she quietly comes and stands between us, preventing any aggressive, “rammy” behaviour. Posey is the most tame sheep in our flock and eagerly anticipates a good massage on her shoulders or hind legs. The kids and I discovered that if we are extra quiet when we pet her, she even seems to fall asleep standing up! 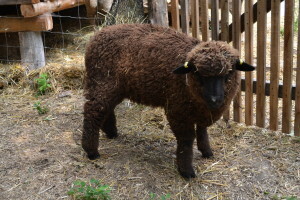 Posey was born in April 2014 to a Delaine merino dam and sired by a Rambouillet merino. Flora is Posey’s sister and the beauty queen of the flock with her movie star mole over her lip. 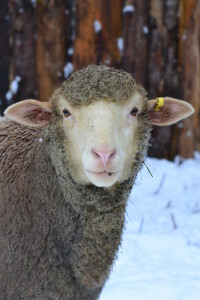 Flora was born in April 2014, one of a set of triplets to a Delaine merino dam and a Rambouillet merino sire. Flora has wonderful mothering instincts and “adopted” our youngest ewe. Like Posey, Flora is very tame and enjoys being pet and handled. 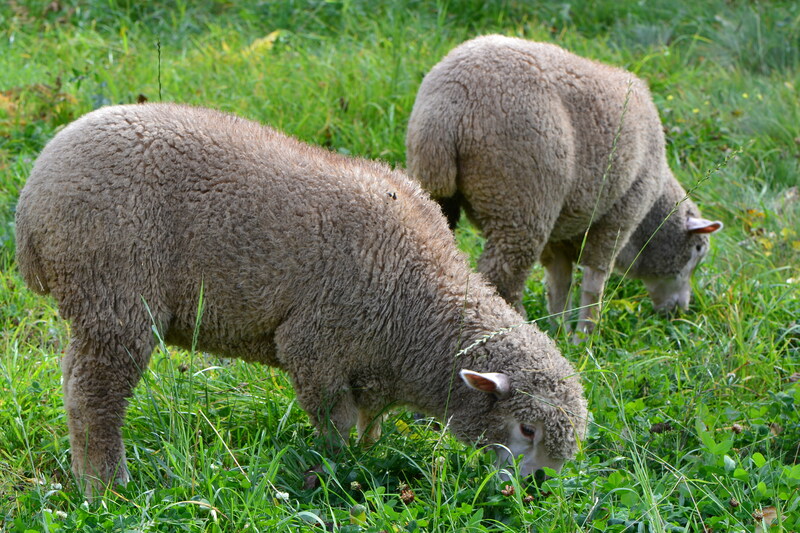 Both merino ewes have stunning fleeces that make the softest of wool. 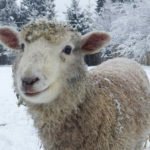 Sugaree is an aloof ewe who prefers to keep her distance from people. She was our first sheep to arrive here from a less than desirable place. We were so happy to welcome her here, though it took awhile to nurse her back to health. Today, she is robust and energetic, happy with her flock and especially with Clover the guardian dog. Sugaree was born in April 201 and she is an interesting cross of 1/2 Rambouillet merino, 1/4 Cotswold, and 1/4 Romney. 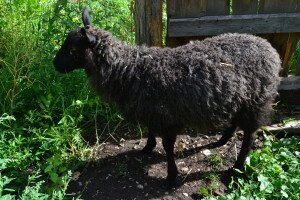 Her fleece is exceptional and makes wonderfully soft yarn. 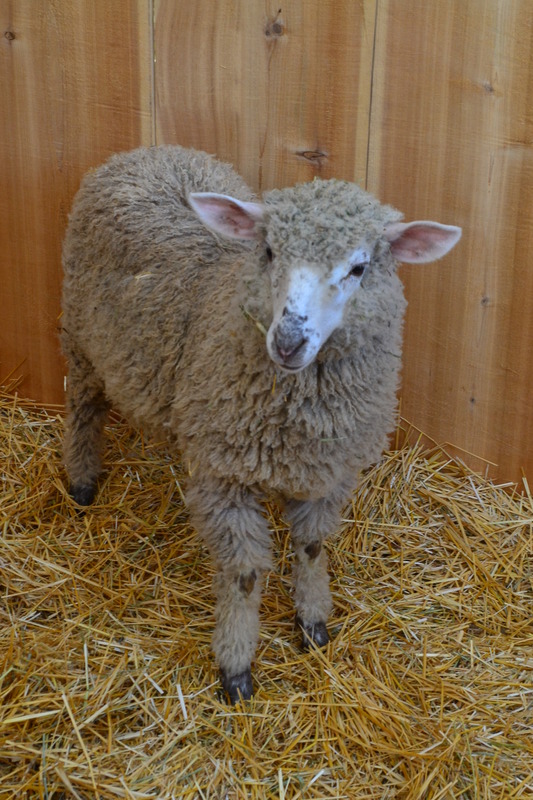 Stella Blue is our newest ewe who arrived in 2015. She is a Gotland cross with a gorgeous grey fleece. 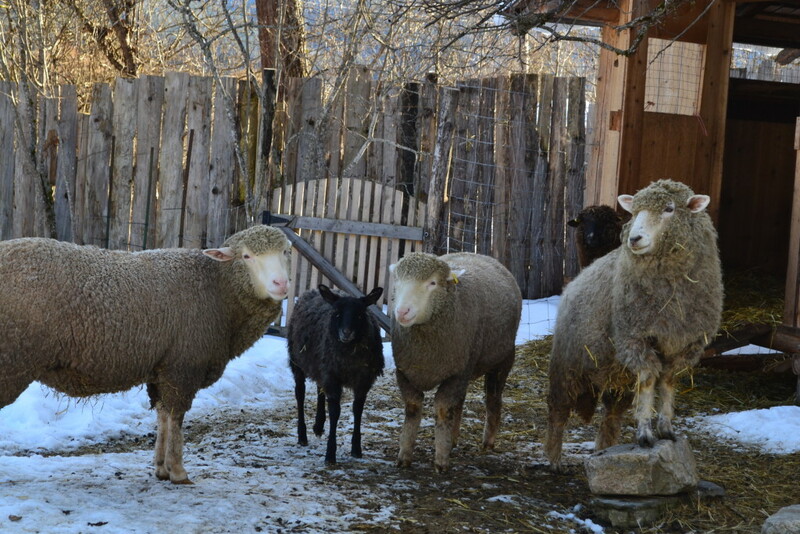 Her sire was Gotland and her dam was 1/2 Shetland and 1/2 Blue Faced Leicester. Stella has slowly warmed up to our family and now is very personable and friendly, enjoying scratches under her chin. She is a clever sheep, ever watchful of life outside the fence in a cautiously curious way. 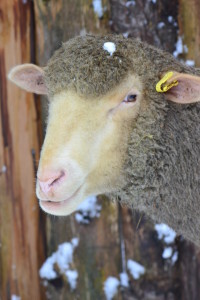 Her fleece has a beautiful crimp and good staple length, making it very easy to spin. Romeo came to Gladsheim Farm in July 2015. He looks like a big teddy-bear, or Snuffaluffagus from Sesame Street…maybe a cross of the two! He is friendly enough, for a ram, and he speaks with a hoarse baaa that makes us giggle everytime we hear it. Romeo was born February 2015 and is a registered purebred Romney. I bought him to bring some staple length to the merinos and his fleece is quite gorgeous. 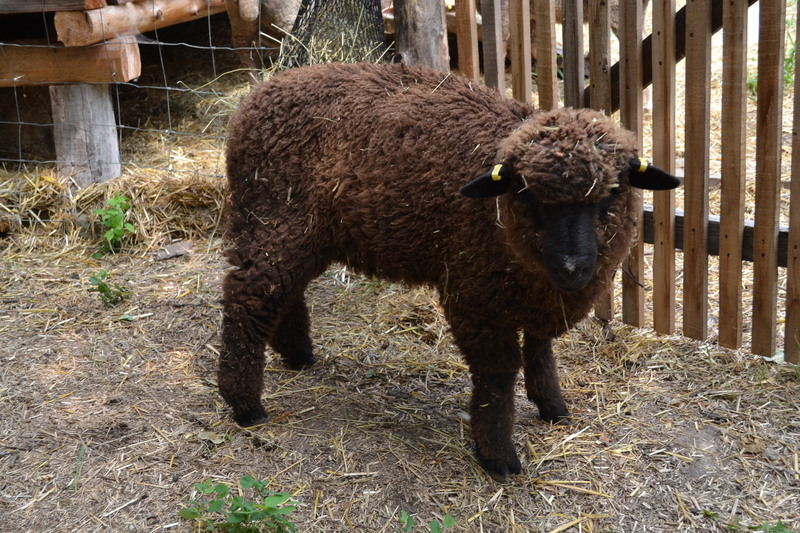 Beneath his sun-kissed locks is a chocolatey brown fluff of crimpy, lustrous fleece. Our four ewes are all bred by Romeo and due to begin lambing in mid to late April 2016. It will be very exciting to see who is growing beneath all that fleece, in the mama’s bellies!